All of my life I have been a fan of anime, science fiction, and post-apocalyptic fiction. Akira is a combination of all three of these, which alone justifies my love for the film. 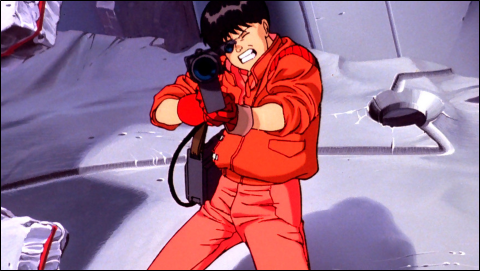 However, there is much more to Akira that has made it one of the most popular anime movies, and allowed it to withstand the test of time just as much as its source material from which it is adapted. At over 2,000 pages long, the film is not a bad way to acquaint yourself with the series, as it is guaranteed to have you wanting to read the manga once you have finished it. The year is 2019, and thirty-one years ago a catastrophic incident triggered World War III, destroying Tokyo in the process. This tragedy was connected to the titular Akira, a mysterious source of power sealed away deep under the reconstructed city, now known as Neo-Tokyo. Neo-Tokyo is plagued by biker gangs, political strife, terrorism, and general civil unrest. The protagonists are members of one of the aforementioned bike gangs, the Capsules: the confident and oblivious Shotaro Kaneda, and Tetsuo Shima, Kaneda’s close friend and resentful rival, who constantly attempts to prove himself to his allies. During one of their usual fights against their rivals, the Clowns, Tetsuo is injured upon incidentally meeting an esper, a being with green skin, the form of a child, but the appearance of an elder with psychic abilities. This confrontation endows Tetsuo with powers as well, and as his powers increase, his mind deteriorates, and the government, the rebellion, and the Capsules race to stop Tetsuo from freeing Akira and destroying Tokyo once again. As he continues to grow more and more powerful, Tetsuo also becomes less stable mentally. His character arc is a sympathetic one that also makes him detestable simultaneously. We all can relate to a character who is mistreated and underestimated by those around him, and who strives to prove his worth. However, Akira begs the question: what becomes of a man who is given all the powers of the universe, but knows not what to do with them outside of his own selfish desires? This is a query that has hung over and cursed mankind since the dawn of creation, and will continue to do so until its end. The original manga from which the film is based was six volumes long, telling a substantially more complex story that provided social commentary on a post-atomic bombing Japan, over-population, and rebellion amongst Japanese youths. These themes are all present in the film as well, but due to its condensed length, many subplots are mentioned and dropped soon thereafter, their impacts not being felt entirely in the endgame of the picture. Nonetheless, the film still works, even while juggling these subplots because of the fact that they all work together to create an observation on Neo-Tokyo’s society, even if it isn’t entirely cohesive as it does so. The animation here was groundbreaking upon its release in 1988, and it is still impressive to this very day. The character animations are fluid, from their actions to the movements of their mouths, though as well as it may work in Japanese, this is a detriment in the English dub due to the awkward dialogue and synching that consequently occurs. However, the action is fast paced and crisp, and the city and environments intricately detailed. This is without mentioning the grand soundtrack. It is full of tribal beats and ominous chanting that makes the action tenser and adds a layer of annotation to the post-apocalyptic society. All of this is a testament to the director, Katsuhiro Otomo’s vision and imagination. Akira truly is one of the best anime films, and classic sci-fi films to have been created.